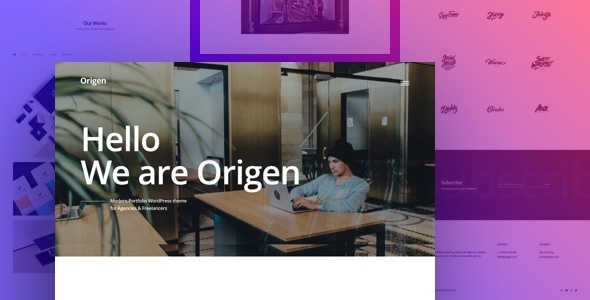 Origen â€” is a Modern Portfolio WordPress theme for Agencies, Studios, Designers, Freelancers and so on. Itâ€™s fully customizable with Customizer and Page Builder. The theme focused on Showcase of works and also has a lot of additional marketing sections like: Call to Action, Description, Features, Subscribe, etc (additional element you can find on Â«ElementsÂ» page). On Project page you can create perfect presentation with images and descriptions through Page Builder for show your clients how did you solve the project task. Origen has built-in sections with your contact information for your clients and the page Â«ContactsÂ» where you can leave all your contact info and social links. The design and development of this theme were created with key of modern design which show that you are going in step with the modern tehnologies.